What can Central Asian countries do to sustainably eradicate poverty and become middle-class societies in the future? AKIPRESS.COM - Travelling across Central Asia, one is struck by the dynamism of the region today. Modern high-rise buildings dominate the skylines of major cities, while vibrant markets display goods and services from around the world. It is clearly visible that countries have made good strides in reducing extreme poverty and increasing household incomes after the post-Soviet economic collapse – boosting people’s hopes, aspirations and expectations for the future. Today, on the International Day for the Eradication of Poverty, we take the opportunity to reflect on the important progress Central Asia has made in recent years, but also on the challenges and opportunities facing the region going forward in building its middle-class. In Kazakhstan, extreme poverty has been virtually eradicated, while the middle-class has grown to around 20% of the population. The Kyrgyz Republic and Tajikistan have managed to halve their rates of poverty over the past decade and are continuing to make progress. In Uzbekistan and Turkmenistan, poverty is now mostly a rural phenomenon. These hard-earned success stories are a testament to what can be accomplished when the benefits of economic growth are shared more broadly across society. However, several challenges lie ahead. Central Asian countries may struggle to maintain the progress of the past decade in the face of volatile economic growth and lack of economic diversification. Poverty is especially persistent in Tajikistan and the Kyrgyz Republic, while pockets of poverty remain in Uzbekistan and Turkmenistan. Many people who have been lifted out of poverty are still vulnerable to falling back, particularly in the event of unexpected shocks such as sudden health problems, job loss, or a natural disaster. 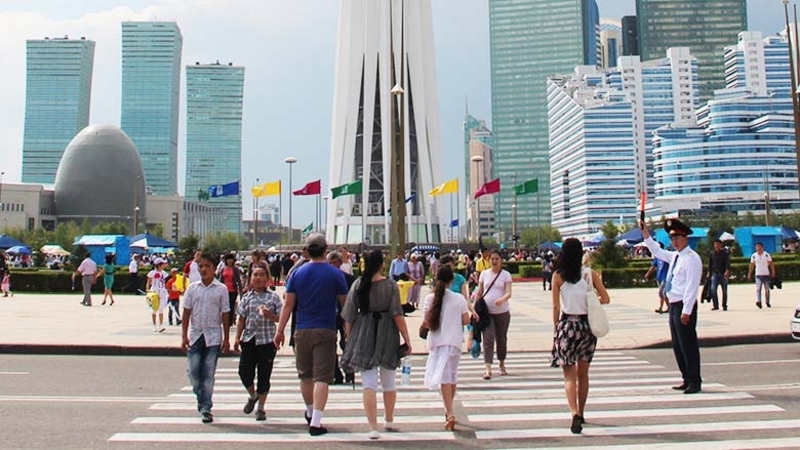 What can Central Asian countries do, therefore, to sustainably eradicate poverty and become middle-class societies in the future? To begin with, governments must help people and businesses become more productive. This means creating an environment where everybody has access to economic opportunities, which improves the allocation of resources and unleashes previously unexploited opportunities for greater productivity. With higher productivity, people’s welfare improves. It also means providing better basic services, such as healthcare and education, which are instrumental to improving the capacity of all citizens to contribute to society. Making financial services more broadly available is another must. People who use financial services, such as credit and insurance, are more likely to start and expand businesses, and to invest in education or health. Allowing previously excluded groups, such as women, youth, or people with disabilities to have access to economic opportunities also leads to greater results. Equally important is strengthening the resilience of households to shocks. Access to private insurance markets, for instance, can help people cope with unexpected health problems or climate-related events. Public unemployment insurance can help workers who suddenly lose their jobs. Building the middle-class also demands that policy makers promote people’s capacity for independent decision-making. This means ensuring that public administration is more responsive and accountable, and that previously excluded groups can have a say in the policy process. It also means providing higher quality goods and services that meet the expectations of citizens. Systems that are participatory, inclusive, and that represent diverse views, help to ensure that policies are aligned with the needs of the people. The World Bank is working hand in hand with the governments of Central Asia to further these goals. In Kazakhstan, for example, we are helping ensure that more than 2.6 million schoolchildren receive a quality education. In Tajikistan, we are supporting efforts to better target social protection to the neediest households, while also helping to strengthen bridges and other critical infrastructure against natural hazards. In the Kyrgyz Republic, we are working with the official statistics agency to publish detailed information on poverty and labor markets. In Uzbekistan, we are working with the authorities to improve water resources management, and in Turkmenistan, to develop the national welfare monitoring system. These efforts are part of our larger commitment in Central Asia, where we have been working for more than 20 years to support countries in their efforts to end poverty and boost shared prosperity for all. But as we reflect today on past successes, we also want to look forward and help Central Asia realize its dreams for the future.